Mission: to provide Christ-centered, integrated, affordable and quality health care to those who need it most. The vision for Compassion Health Toledo came from two Toledo doctors who had been spending months of their time each year serving the poorest in Guatemala. They started questioning why they weren't also providing care for the under-served in their own home town of Toledo, Ohio. Searching for an understanding of the issues faced by the most marginalized in our city, one of them began working on a downtown mobile medical bus sponsored by Lifeline Toledo which was started by Pastor Steve North. Through her experience on that bus, she came to better understand the medical and social needs of members of her own community; needs that were not too much different than what she had experienced in Guatemala. This led her to a desire for a permanent solution for this population in Toledo and that is Compassion Health Toledo. 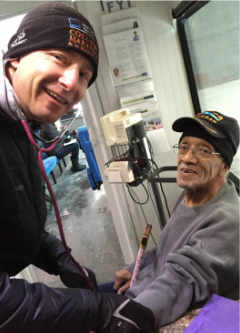 Left, you can see one of the Lifeline volunteers serving one of our most delightful "regular" patients on the bus. Compassion Health Toledo was created through coming to know these patients in the way that Jesus would have us know his poorest. In search of a successful model for reaching these people, Steve North led us to Covenant Community Care in Detroit, Michigan. Covenant Community Care shares our vision and already has a proven record of success with their seven clinics that now serve the poorest of the poor. They are selflessly working with us to now create a health care system that will serve those most desperately in need of health care in our own community. The Mission of Compassion Health Toledo is to provide Christ-centered, integrated, affordable and quality health care to those who need it most. The Vision of Compassion Health Toledo is to create a vibrant multi-faceted faith based clinic where like-minded professionals from a variety of backgrounds are recognized in the neighborhood as a trusted collaborative team who improve the health and well-being of individuals, families and the community. We envision a place where we can respond to others as a covenant people who act justly, love tenderly and walk humbly with God (Micah 6:8). We envision that our patients are transformed by the love of God shared through us. We value the transformational nature of service in both the servant and the served. We are accountable to Christ and to each other as a team who is spirit led in a shared faith based calling. We value the knowledge that it is only through the love of Jesus Christ and by following God’s will for our lives that real healing can begin. We are privileged to share in the suffering of those who are hurt, lonely, in pain, and who are vulnerable and powerless. We value all of creation as having worth and every person as having the dignity inherent in being a beloved child of God. We envision a community center where we serve patients in such a way that they are educated and equipped with the skills and tools they need to maximize their physical, psychosocial, spiritual and mental health. We recognize and value the essence and best that medicine, nursing, pharmacology, dental, mental health, pastoral care, public heaths and other health care specialties have to offer. We work with other like-minded organizations and reach out to the local community where Christ is at the center. We plan for a financial sustainable organization where funds, resources and personnel help meet the needs of the community and allow for growth potential.